Oxford-based artist, film-maker and writer Roma Tearne lives and works in the centre of the city. She tells Sandra Kessell about painting, writing and the literary festival on her doorstep. Beyond Oxford’s towers, spires, quads and high-ceilinged Dons’ houses lie the less grand cottages and terraces of the artisans, craftsmen and artists who, over centuries, made or provided the everyday things needed to keep the world of academia ticking over, allowing academics to study and philosophise, teach and theorise without having to get too involved in day-to-day living. Meeting the multi-talented Roma Tearne in one of these quirky little houses, close to the canal, seems very fitting in the 21st century. 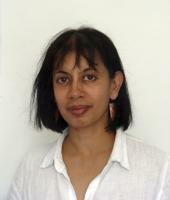 She could epitomise the modern Oxford resident – cultured, intelligent, artistic and, for good measure in a city that has one of the highest proportions of residents born outside the UK, Sri Lankan by birth. The first thing you notice about Roma is her tiny stature. She’s diminutive – and I find myself looking for her when she answers the door to her family home in Jericho, my gaze travelling swiftly downwards to meet her huge eyes. It’s at this house that she writes her novels, having initially made her name as an artist and film-maker. In fact, she’s been so bound up with her writing over the last few years, that she stopped renting a studio because she simply didn’t have time to use it. Not that she’s stopped drawing or collecting the materials for her installations. She customises Moleskine notebooks, stuffing them with observations, sketches, photographs and tiny, neat handwriting that curls around corners creating a visual feast of its own. After hitting the mark with her first three books, Mosquito, Bone China and Brixton Beach, and with a fourth, The Swimmer, due to be published in May, Roma is getting the urge to paint once more and looking at ways of incorporating a studio into her study. Dressed in black, with a black and single red bead strung around her neck, Roma leads me into her house, which is packed with books, paintings, installations, porcelain, colour, mirrors and splashes of light. There’s a penchant for Venetian red and in a cabinet lined with postcards, letters, old photographs – Roma’s junk-shop objets trouvés. She’s a compulsive rummager, she confesses. Her desk is surrounded by bookshelves, photos of her children, printers’ letters, tiny blue glass bottles and other collectibles. It’s like a magpie’s nest, lined and cosy – but there’s a reason for this, I find. Roma lost all her family photos, baby albums and notebooks in a house move and has been seeking solace in documenting other people’s history ever since. Not that Roma can find a word to summarise her professional occupations. She’s neither pure writer nor pure artist, novelist nor narrator, though that hasn’t stopped her being recognised and acclaimed as all of the above. She admits she’s seriously self-critical, which in part dates back to her early university experiences. Reading English she submitted an essay about Charles Dickens and was accused of plagiarism by a discouraging and unenlightened tutor, who doubted her ability to produce such quality work and told her he would send her down if she transgressed again. “I was an 18-year-old immigrant girl who came from London and who had struggled to integrate. Instead of fighting him, I just left. I was writing a novel at the time, I stopped,” says Roma. It had been English that had brought her parents, who had lived with disapproval for their mixed Singhalese-Tamil marriage in Sri Lanka, to England. Her mother had been a journalist, her father a poet. On learning that English was to be banned in Sri Lanka they packed a few belongings, boarded a boat and headed to the UK, bringing 10-year-old Roma to what they thought of as a promised land. The family’s hopes were invested in English in a way few English people’s ever are. “My parents were passionate about the language. It was assumed I would read English and I’d always said I would be a writer,” says Roma. After her university experience she dropped out of her studies but her future was still bound up with the language. She married an English professor and had three children. She trained as a painter, later completing her MA at the Ruskin School of Drawing and Fine Art in Oxford, where she was encouraged to explore other sides of her creativity. Her work was chosen for the Royal Academy summer exhibition and she became a Leverhulme artist-in-residence for the Ashmolean Museum. It was here that her writing came to the fore once more. She started writing short stories about the staff for the staff newsletter. “The staff found it amusing. I had a little romance going and the staff concerned were very chuffed about it,” she remembers. The staff started asking when the next episode would be published and encouraged her to write write a book. Until then no-one had ever read her work. In 2006 she was awarded an Arts and Humanities Research Council fellowship to work at Oxford Brookes University and the following year her first novel, Mosquito, was published and shortlisted for the Costa award for debut novel. Since then she has a produced a book a year and has been a regular fixture at the Oxford Literary Festival, suddenly finding herself on the platform, rather than in the audience. Now a Creative Writing Fellow at Brookes, this year she will be talking about her forthcoming novel at this year’s festival. “There’s an awful lot going on in Oxford,” she says, adding that the festival is good for students as well as visitors. At the end of April, Roma is taking up a week’s residency at Blackwell’s book and poster shops, where she will be investigating the life of a bookshop, its staff, customers and other visitors. Drawing inspiration from paragraphs in books chosen from different departments around the Blackwell’s shops in Broad Street, Roma will produce written and visual work. It’s hard to pigeon-hole or pin down her work, let alone give her a title that sums up her occupations, despite the extensive number of words at her fingertips. What there can be no doubt about is her next creations will be welcomed by her growing army of fans and her talk attended by an eager following. Roma Tearne will be talking at Christ Church on Tuesday, March 23, at 12noon. Her residency at Blackwell’s runs from Monday, April 26 to Saturday, May 1. Her novel The Swimmer is published by Harper Collins on May 3. *This article appears in the March 2010 edition of Cotswold Life magazine. I have recently come across your article about the RAF plane that crashed next to Bratto, the mountain village in tuscany, Italy. My family are from that village and I am a new writer who has written two books and is hoping one day to get something published. I was wondering if you would be interested in looking at one of the books which about the village of Bratto and its people, it not only includes a story about the plane crash itself but many other rather unusual stories that have come from this rural location. We met at the memorial in Bratto – I saw the piece published in the Guardian but the date of the crash was 1943, not 1942 as stated. Great piece! Oh and the story I told you about the old man who found the foot in the boot was my Grandfather Primo, he died back in 1989 but the article records him as being there – i wish he was as I would ask him a million questions. Hows your book on Partisan activity panning out, I have some bits for you on hiding holes, you were going to call by or i was going to call you up – cant remember. Up to my neck in PhD research but going over there on hols very soon – hope you are well – drop me a line sometime. Hi Paul – I’ll pass this on to Roma. Next Next post: My vote counts for nothing – is this 1910 or 2010?